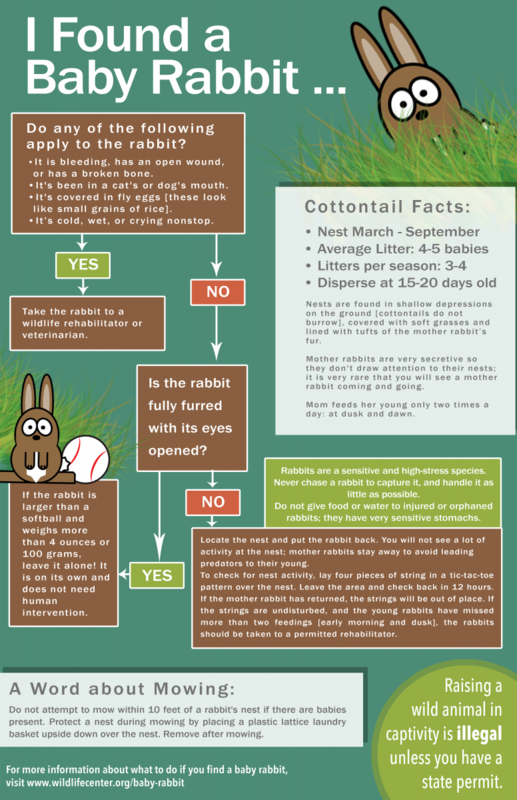 Eastern Cottontail rabbits reproduce throughout the spring and summer, typically starting in mid-March and nesting through mid-September. Nests are found in shallow depressions on the ground [cottontails do not burrow]; nests are covered with soft grasses and are lined with tufts of the mother rabbit’s fur. The average litter size for rabbits is five, though mothers may give birth to as few as one and as many as 12! Since young rabbits grow up quite quickly, “doe” rabbits may have three or four litters in a season. Mother rabbits are very secretive, so they don't draw attention to their nest; it is very rare that you will see a mother rabbit coming and going. The doe feeds her young only twice a day -- at dusk and dawn. Young rabbits disperse from the nest at 15-20 days old. By three weeks of age, they are on their own in the wild, though are still very small -- they're only about the size of a softball! Rabbits have the best chance of survival when they are cared for by their mothers. Is the rabbit injured (bleeding, broken bones, puncture wounds, been in a cat's mouth, open wounds, etc.)? If YES, take the rabbit to your nearest wildlife veterinarian or rehabilitator. If YES, if the rabbit is larger than a softball and weighs more than 4 ounces or 100 grams, it is on its own and does not need human intervention. If NO, attempt to locate the nest (a shallow depression on the ground possibly lined with rabbit fur and/or grass) and put the rabbit back. You will not see a lot of activity at the nest; mother rabbits stay away to avoid leading predators to the nest. If you do suspect the nest is abandoned, lay four pieces of string or twigs in a tic-tac-toe pattern over the nest as straight as you possibly can. 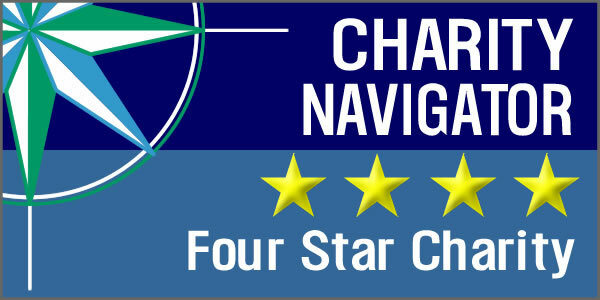 Leave the area and check back in 12 hours. If the mother rabbit has returned to the nest to nurse her young, the string/twigs will be out of place. If the string/twigs are undisturbed, and the bunnies appear thin and weak, with wrinkled, baggy skin, the babies may be orphaned. The babies should be taken immediately to a state permitted small mammal rehabilitator in your area. It's a good idea to check your yard before you mow; because rabbits are in shallow nests, it's easy to mow the "top" off of their nest, possibly injuring babies. 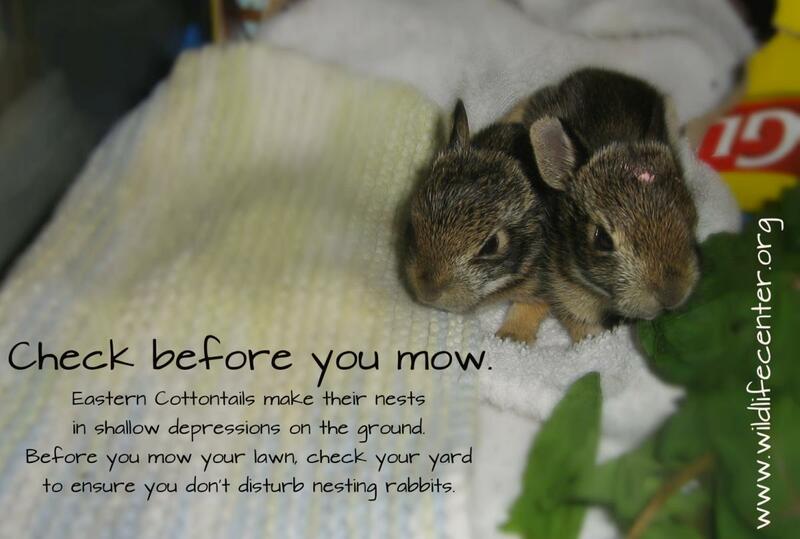 Do not attempt to mow within 10 feet of a rabbit's nest if there are babies present. You can protect a nest during mowing by placing a plastic lattice laundry basket upside down over the nest. It's best to remove the basket after mowing. Leave the nest area as undisturbed as possible while the young rabbits grow. If the nest must continue to be protected, cut a hole in the laundry basket very close to ground level about 3-4 inches in diameter so that the mother rabbit can enter/exit from either side. If you have a dog who has access to the nest/basket, place a very heavy rock or object on the overturned laundry basket (not so heavy as to crush the basket). Once the babies are gone, the basket can be removed and the nest destroyed if you are trying to prevent the nest from being reused. Never chase a rabbit to capture it. The stress of being chased can be dangerous to a baby rabbit. Rabbits are a high-stress species prone to a condition called capture myopathy, which is caused by chase and stress. Capture myopathy can lead to damage to internal organs, and even death. Never give food or water to injured or orphaned wildlife. Inappropriate food or feeding techniques can lead to sickness or death. Baby rabbits have particularly sensitive stomachs and require a special diet. Cow’s milk will make them sick. NOTE: Each animal's nutritional, housing, and handling requirements are very specific and must be met if they have any chance of survival. Raising a wild animal in captivity is illegal unless you have a state permit. For information on how you can become a permitted wildlife rehabilitator, contact the Virginia Department of Game and Inland Fisheries [PDF], visit our wildlife rehabilitation training page, or contact your state's wildlife agency.